Intermediate Girl Scouts, who later were divided into the Junior and Cadette Girl Scout programs, and the Senior Girl Scout program. Some pins are now being reproduced for wear on adult uniforms signifying that they were earned in their youth. Girl Scout Service Bureaus sprang up in the early 1940's in a respond to Girl Scout pleas as to how they could help their country during the war effort. 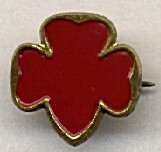 Using lists created by local councils, girls selected projects and when completed, they could wear this 1/2" red enamel trefoil pin on their uniform. This pin could be earned by Brownies, Intermediates and Senior. Original cost - 5 cents. and paid for by the Juliette Low World Friendship Fund. The highest award for girls, exemplifying the best of Girl Scouting. (Senior Girl Scouts may also earn this award). of community and Girl Scouting. The first 4 Challenge Pins were introduced in 1963. They were designed to give Cadettes real-life experience and to test their ability, knowledge and skill. 8 Challenge Pins were added in 1972, to continue to challenge Cadettes. This phase brought a change to the way a Cadette could earn her First Class Badge - now it could be earned just by completing the challenges alone - although the 2 other ways were still good - earning badges, and earning badges and challenges together. 1963; Social Dependability, Emergency Preparedness, Active Citizenship, Girl Scout Promise. 1972; Arts, Community Action, Environment, International Understanding, Knowing Myself, My Heritage, Out-of-Doors, Today's World. The Curved Bar Award started in 1940 to give First Class Girl Scouts something more challenging to do. At first a gold curved patch was worn on the uniform. The pin was introduced in 1947 and was worn on the Intermediate uniform. in Girl Scouting as a girl. This little 1/2" goldtone pin was GSUSA's answer to the sorority pin craze of the late 30's and 40's. Senior Girl Scouting had become separate group (along with Intermediate Girl Scouts and Brownies) in 1938. This style of pin was developed to reflect the mood of the time, while remaining a true Girl Scout pin. The traditional logo has 7 stars. The sunburst has 12 beams to show the many directions of Girl Scouting. (Side note: the 5-point star pin was earned and replaced this design on the uniform once the requirements were met). 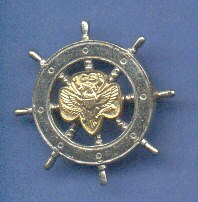 This pin was the membership pin of Senior Girl Scouts until 1963, when they returned to wearing the traditional logo pin. earned by Senior Girl Scouts. It was replaced by the Senior Challenge in 1987.
on their way to earning their Silver Award. and Developing Values for Living. The First Class Pin was never worn on the Intermediate or Junior/Cadette uniforms - they worn the patch. However, once a girl reached Senior Girl Scouting, the First Class pin was a part of uniformed wear. 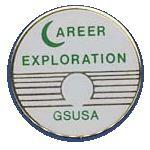 This pin is now being officially reproduced for wear on adult uniforms. The 5 Point Program began in 1951, however the pin was not introduced until 1955. 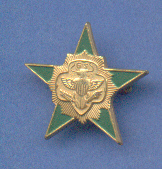 This program was generally completed in 1 year and the pin was worn in place of the Senior Membership Pin on the uniform. and cost 40 cents for several years. next to the membership pin.